"When a data page is read from disk, the page is copied into the SQL Server buffer pool and cached for reuse. Each cached data page has one buffer descriptor. Buffer descriptors uniquely identify each data page that is currently cached in an instance of SQL Server. sys.dm_os_buffer_descriptors returns cached pages for all user and system databases." Thus, sys.dm_os_buffer_descriptors contains a row for every Page(8k) that has been cached in the Buffer Pool and this Dynamic Management View can be used to determine how much Buffer Pool Memory each database and it's objects are consuming. It is recommended to monitor, log & alert on these values over time and especially track if any changes occur due to Database Code Releases. Page Life Expectancy(PLE) measures the time a Page(without being referenced) will reside in the Buffer Pool BEFORE it is removed. PLE is measured in seconds and is a point in time value. A commonly used value to alert on is based on your system configuration and using the formula DataCacheSizeInGB/4GB*300. i.e. 25GB Data Cache Size: 25/4*300 = 1875. Thus, if PLE drops below 1875 and stays, investigate to see why Data Pages are being removed from Buffer Cache so quickly - possibly due to activity such as missing indexes, table scans, large query executing, etc. If memory pressure is removed, the PLE value will increase by 1 every second. NUMA means Non-uniform memory access. 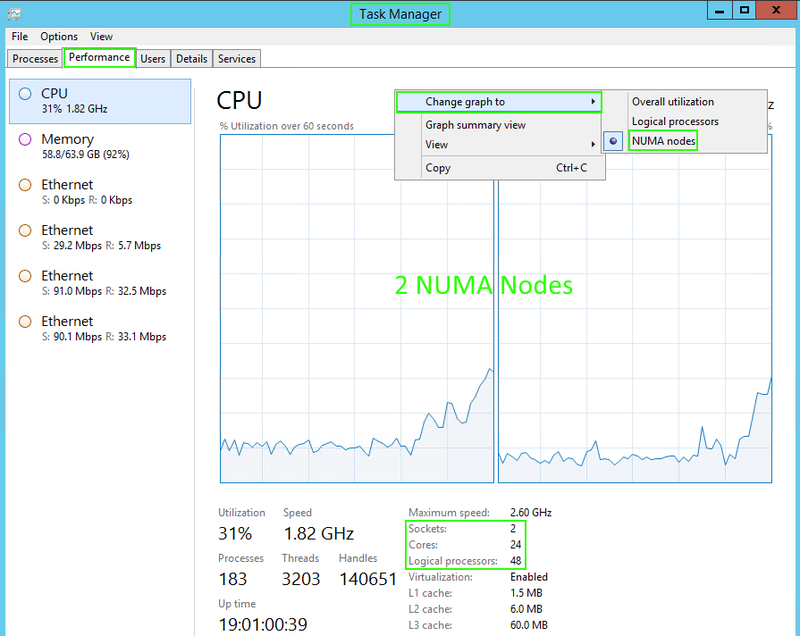 NUMA Nodes specifies which part of system memory is local to which CPU. Each Node contains processors and memory. Under NUMA, a processor can access its own local memory faster than non-local memory, that is, memory local to another processor or memory shared between processors. The idea is to avoid a performance hit when processors attempt to access the same memory. 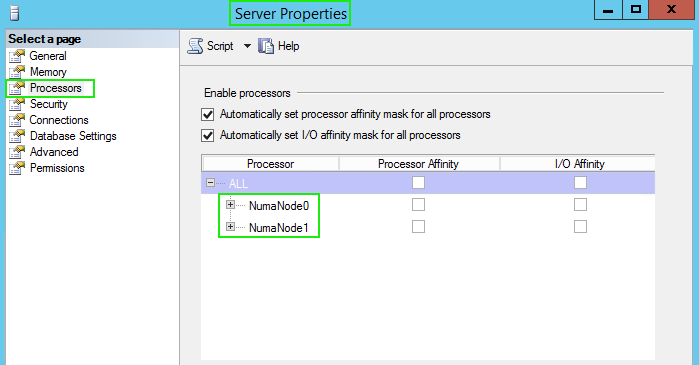 For every available NUMA node, SQL Server creates one dedicated Memory Node (ignore Memory Node ID = 64 which is for the Dedicated Admin Connection). Node configuration: node 0: CPU mask: 0x0000000000ffffff:0 Active CPU mask: 0x0000000000ffffff:0. This message provides a description of the NUMA configuration for this computer. Node configuration: node 1: CPU mask: 0x0000000000ffffff:1 Active CPU mask: 0x00000000000000ff:1. This message provides a description of the NUMA configuration for this computer.